I have been following Mindflash since it started as a beta. The product continues to add new features that overall are surprisingly solid. However, they continue to incorporate some instructor led training components, which is a disservice to an otherwise nice product. 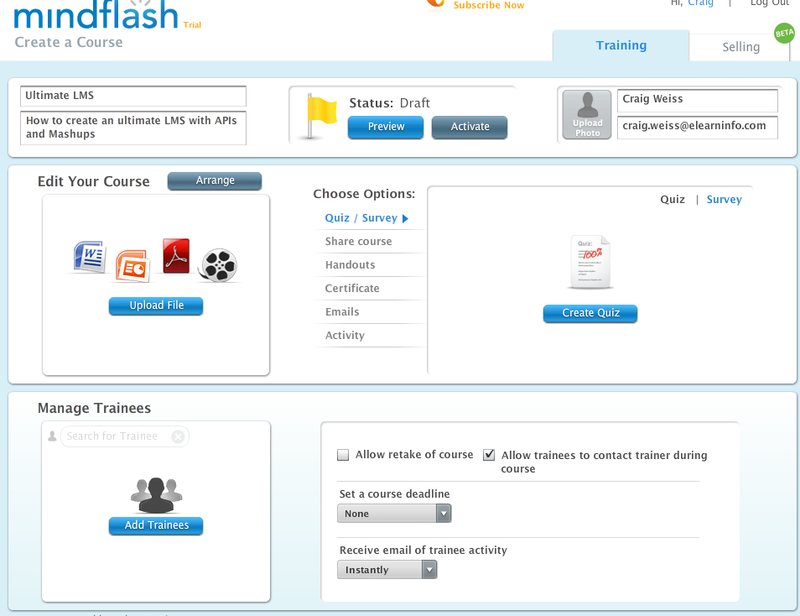 After logging into Mindflash.com the program goes to the default dashboard, which for some reason is the “selling” tab and not the “training tab”. It is simple to switch, just by clicking the “training” tab, but to me it seems to make more sense having the default be the “training” tab. 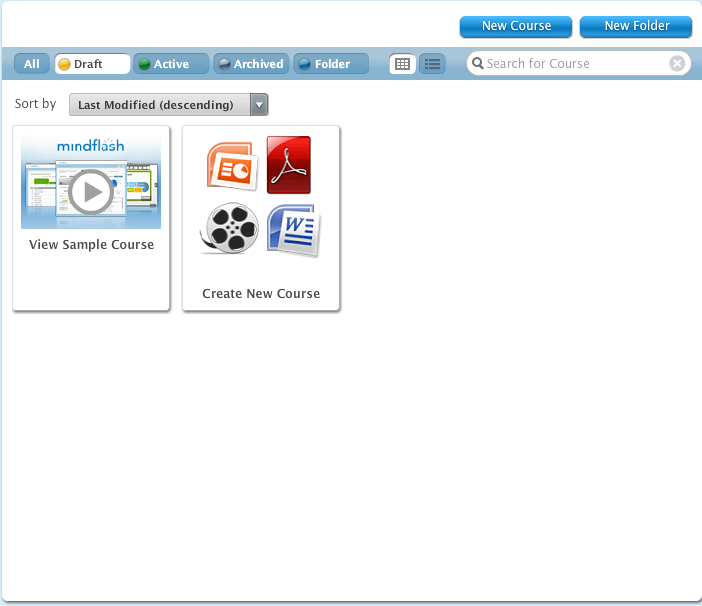 This is really a very nice and easy to use feature with the Mindflash product. 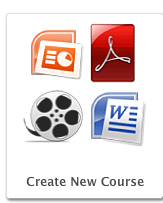 To create a course you click the “create a course” window and you are off and running. If you are ready to create the course, simply click “edit your course”. 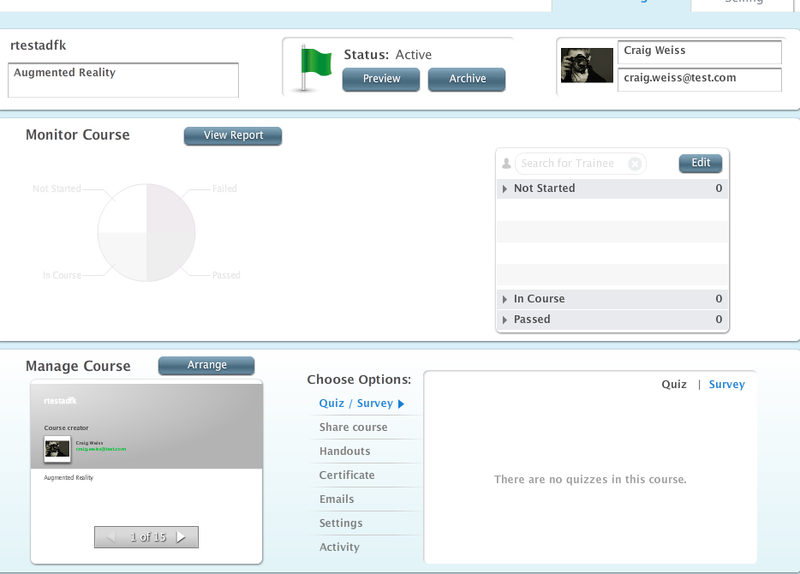 This will take you to a new screen, which enables you to enter in your course name, and work on the course. I found that there is a lag in terms of time for the “file” to be converted. I tested this twice, once at night and once in midday. Both times, it was slow, even though they were PPTs containing 16, 14 slides respectively. For the night upload, the lag time was two to three minutes. While this may not seem like a long time, compared to the speed at which Mindflash goes through the access and screen steps, it drags. For the midday upload it took several minutes. After you upload your file, you are ready to begin. The main slide window, shows the slides or whatever you chose via mid thumbnail windows, along with the word “insert” in between each slide/whatever. To insert a quiz, document, pdf or video you click “insert”, find the file on your computer and upload it. I found it to be quick and easy to do. Adding a YouTube video (a very cool feature) is very easy as well. Locate the YouTube video of choice and simply enter the YouTube hyperlink into the YouTube box in the course creation area. Then click “done”. It is that simple. What I liked about the YouTube and inserting other files is that in the timeline, they appear as separate timelines, under your course and into/outro timelines. This is a very nice feature, because it eliminates the “what is” and “where is” concern people often have with multiple variables. It is also nice, because it aligns to what many people see when they are editing videos in their video software. Now, here is the fun part. If you want to move the video, YouTube, doc, pdf or quiz to another section in the course, it is really easy to do. You simply drag the item, which is visible on the separate timeline to anywhere in the course that you want to drop it. You view where you want to go, by looking at the mid size thumbnails (which are quite visible and do not require you to use any zoom functionality). 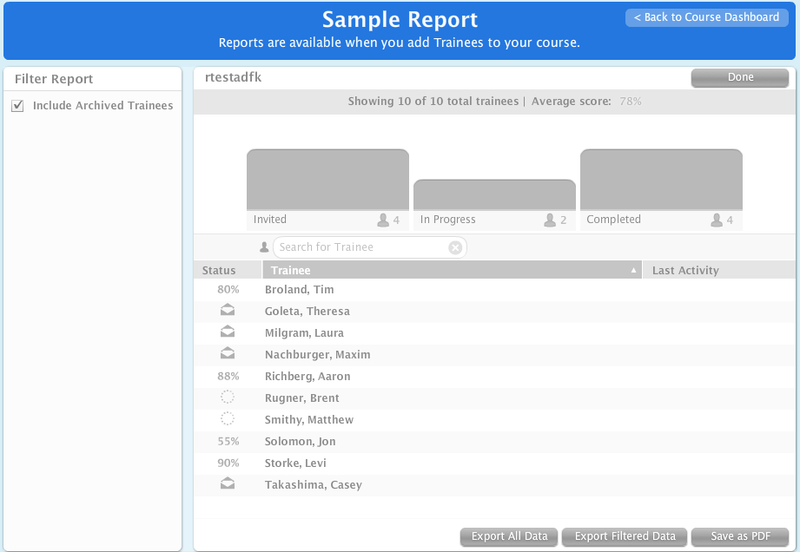 When you are ready to preview your course, simply click “Preview” and it will open a new “Preview” window. I have always been a huge fan of separate “preview” windows and Mindflash doesn’t disappoint. Course Launch – Are you ready? When you are ready to activate the course, click “activate”. A pop-up will appear with some brief information, including letting you know that the course is live, invites have been sent and a few other items. It shows up using colors to represent each area. When you are ready to view the report, click “report”. The report provides you with the following information as related directly to that course. The downer of the reports is that I can see it only by course, rather than as a whole. While I understand the by course option, some people – including myself, enjoy seeing an entire list by course, and other data. This can be achieved but it requires you to export the data into a spreadsheet, course by course, and honestly who wants to do that? With the reports as noted, you can export the data or save it as a .pdf file. Mindflash has a variable pricing structure, which depends on the number of trainees and a couple of options (which you receive for the paid versions). The system comes with a 30 day trial and does not require you to enter a credit card. A huge Kudos to Mindflash on this approach. I’m a big time fan of vendors who post their pricing on their site. Trust me, people are going to see what your competitors are doing, so the argument that we don’t want to tell you because of competition is lame, especially when there is never a problem listing your pricing on a RFP. One item that I found very cool with Mindflash is the ability to share the course via Twitter, Linkedin, Facebook and e-mail. While it would be nice to see other social media channels available, having it available for the big three is very slick. Hopefully others will follow suit, especially with Linkedin, which is highly used by professionals – i.e. your target audience. I have always been a fan of Mindflash as a whole, but readily admit to not recommending it because of their insistence of using instructor led terms for an online learning environment. Mindflash has told me in the past, that they do not offer non-linear and thus a TOC (table of contents) in the active courses because people are not asking for it. However, I have always felt that to be a poor excuse. In the ILT world, it would be expected to find people who are unfamiliar with WBT, its terminology and its premise, so as the vendor you should know this information. I’m not saying that Mindflash doesn’t, on the contrary, I know they do, especially when you consider the non-linear navigation option they offer in the preview window. Why this isn’t an option when the course is live, is incomprehensible. That said, if you look at the solution from its “training management” perspective, and that perspective is infusing a greater instructor led training approach with some online components, then yes, it fulfills what it sets out to do. Personally, I’m disheartened at that approach, because e-learning should be distinguishable from its instructor led cousin. The problem with Mindflash.com, it’s not. No mention of SCORM. Do they allow courses created elsewhere to be uploaded? They do not. One of the downsides for most online authoring systems is that you cannot output their courses into a LMS, nor can you input any other 3rd party authoring tool courses into their product. With the exception of Claro – which enables you to output to a LMS (albeit, they prefer you use their online system) and which supports PENS and SCORM, the extensive majority of online authoring systems are proprietary and thus do not use any compliance standards. Systems like Mindflash.com or Odijoo, etc. are online authoring systems, they are not LMSs nor Lite LMSs.